The summer is here and it is finally hot enough that we are getting vigorous growth. The 2nd year Cascades are almost done growing vertically with a bit to go still on the Willamette. Saying that Brett has been in Ukraine for 2 weeks, he has to trim up the top of the plants when he gets back (tomorrow). 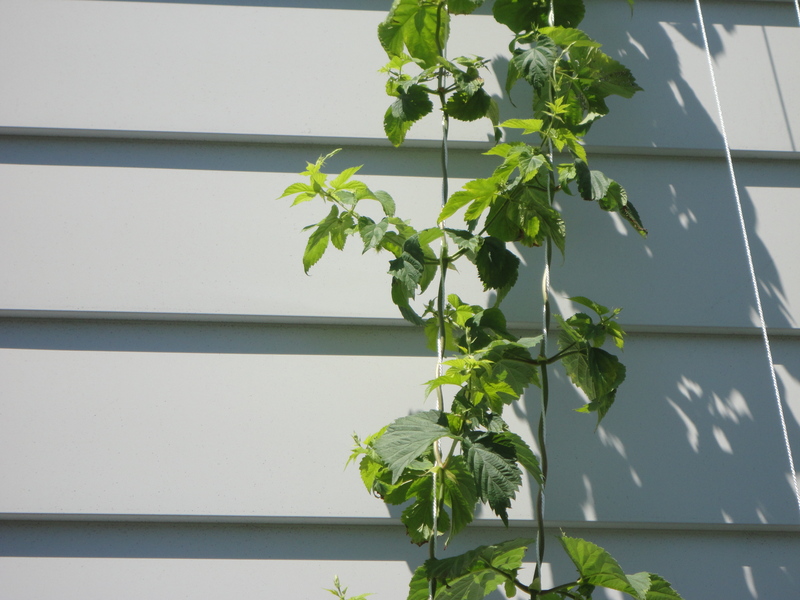 We are getting some good horizontal shoots growing and we hope to see some hop cones soon. 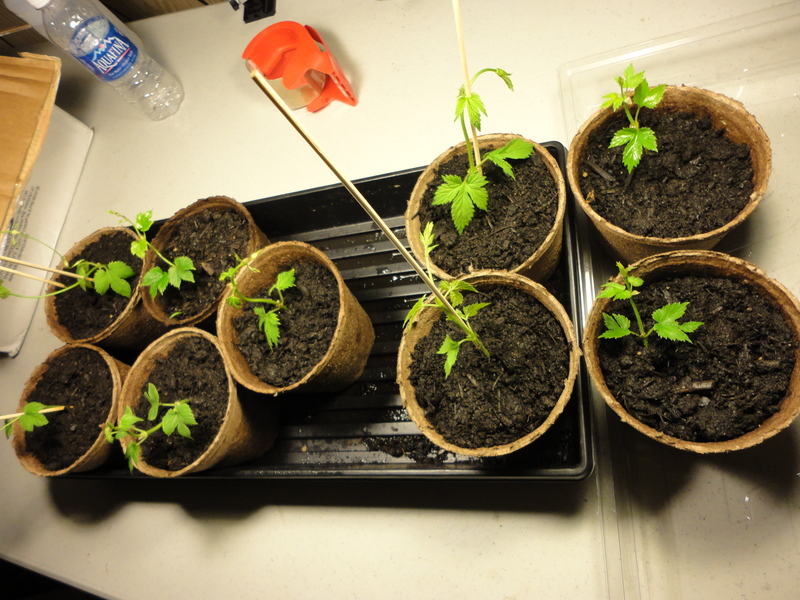 The plants will begin to fill out more once we trim the tops. Our first year cuttings are going strong in my backyard. 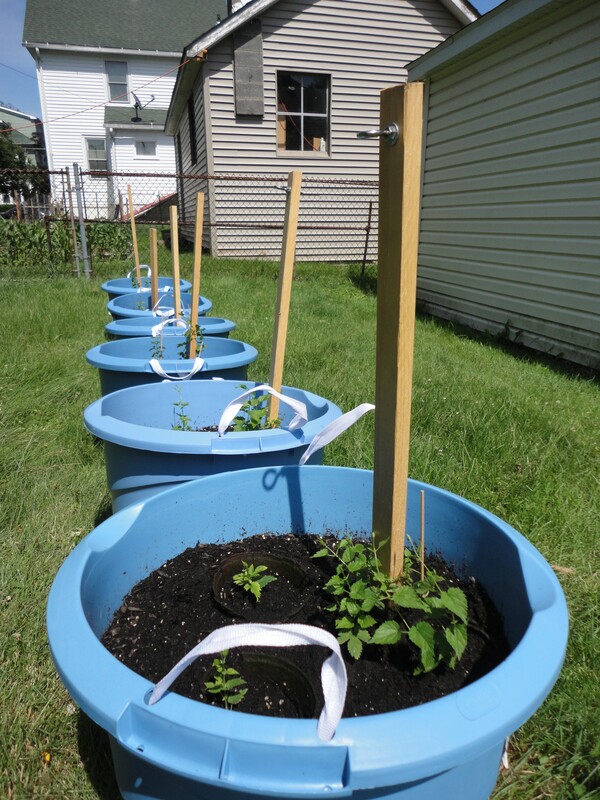 They are also planted in 18 gallon buckets. There is enough space at the top of the bucket to top off with compost at the end of this fall. 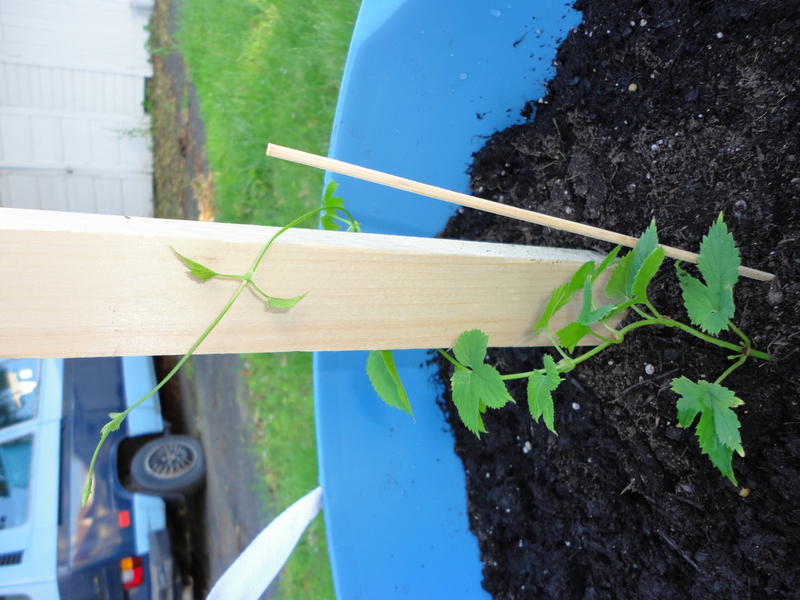 The cuttings now have multiple bines from each plant; the first bines are not growing as fast as they were, and many of the secondary ones are taller than the initial ones. 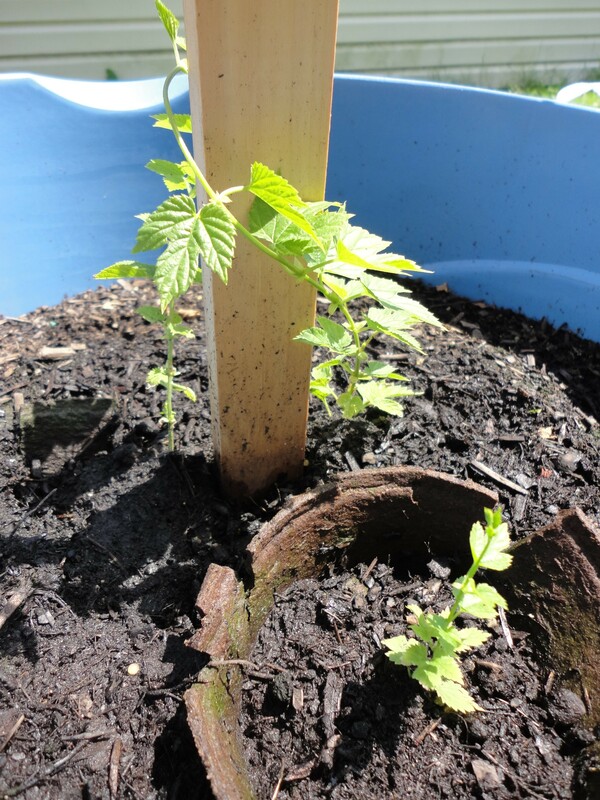 This year, I am not concerned with hop weight as much as I am about root growth, which sets us up for 2 things: a big harvest for next year, as well as being able to take many rhizome cuttings to start a larger hop garden. 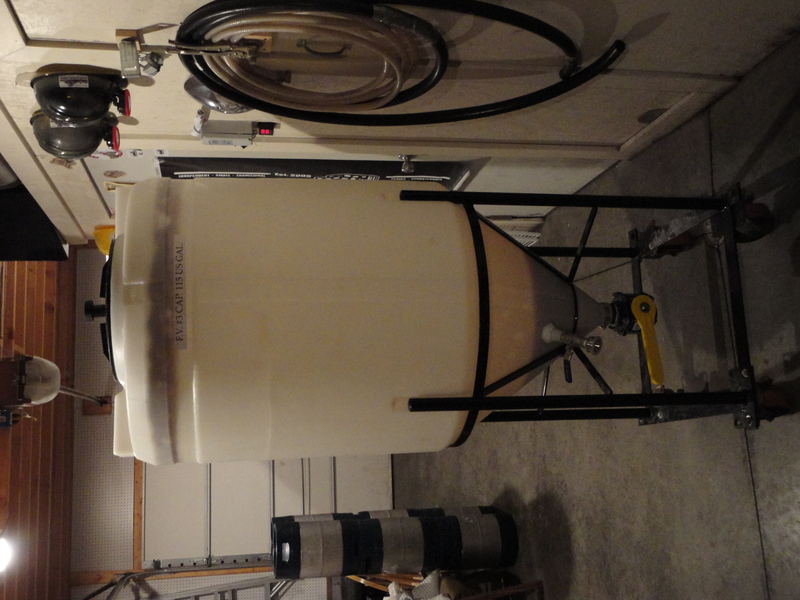 This is the the first post about our brewery’s hop project, and most of this info will be converted to full tutorials in the future, but for right now, I will put it all in one post and sort it out later. 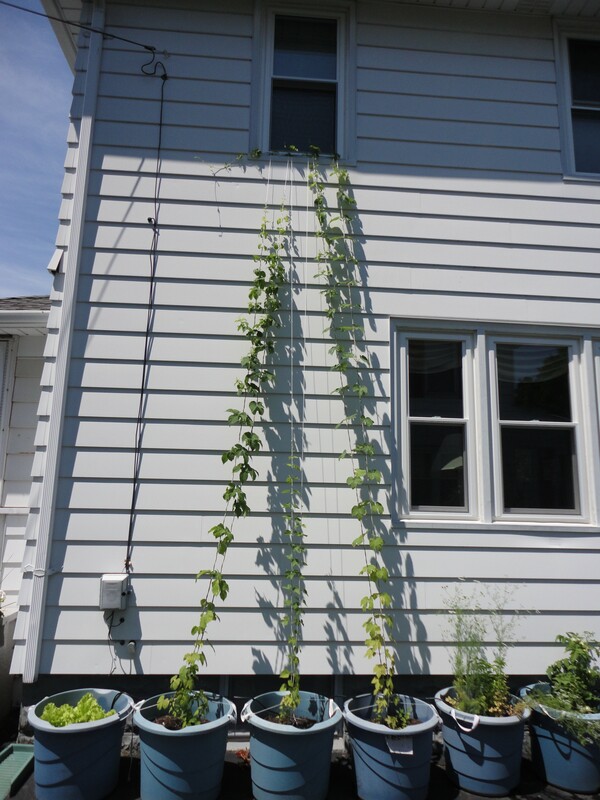 At the brewery, we currently have 3 second year plants growing strong; 2 Cascade and 1 Willamette (pic above). They should give us a bunch of hops to brew a few batches of beer with. This year I am stepping it up and putting as many cuttings into planters as possible. We have been using 18 gallon plastic buckets with holes drilled in the bottom for drainage. Today, I moved my 2 most solid cuttings out doors into the same kind of planters; these are in the backyard at my house. For the last 2 and half weeks, these cuttings have been in peat moss planters under Compact florecent bulbs. 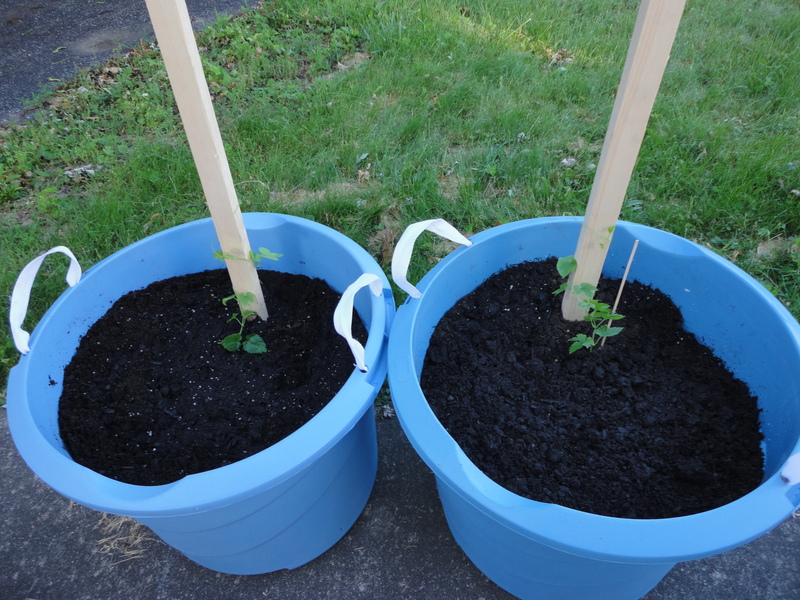 They both have nice sized root masses, and were too tall to support in the smaller pots. The plan for this year is a horizontal grow, while I figure out what I want to do with the yard long term. Since they are in planters, I can move them at any time. I have a garage that I will soon be attaching eyelets along the side. 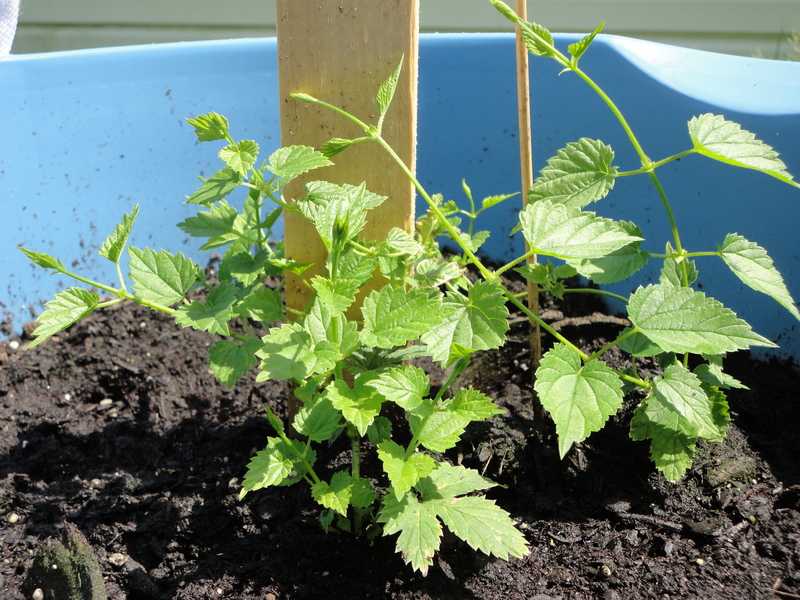 Across the yard 20 feet or so, in constant direct sunlight, the hop buckets will be. In each bucket is a 3 foot long board, with an eyelet bolted through. The board is buried and so the top is about 20 inches above the soil. 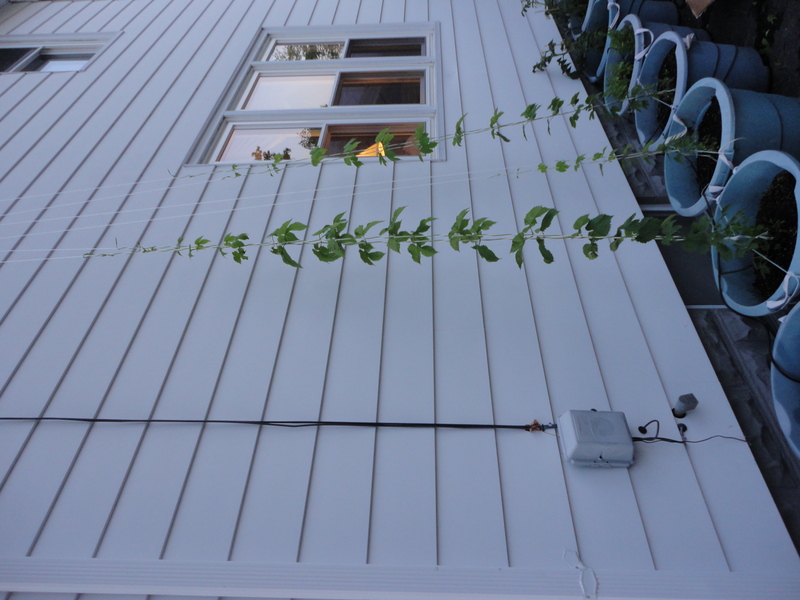 The hops will grow up the board and down a wire to the garage. 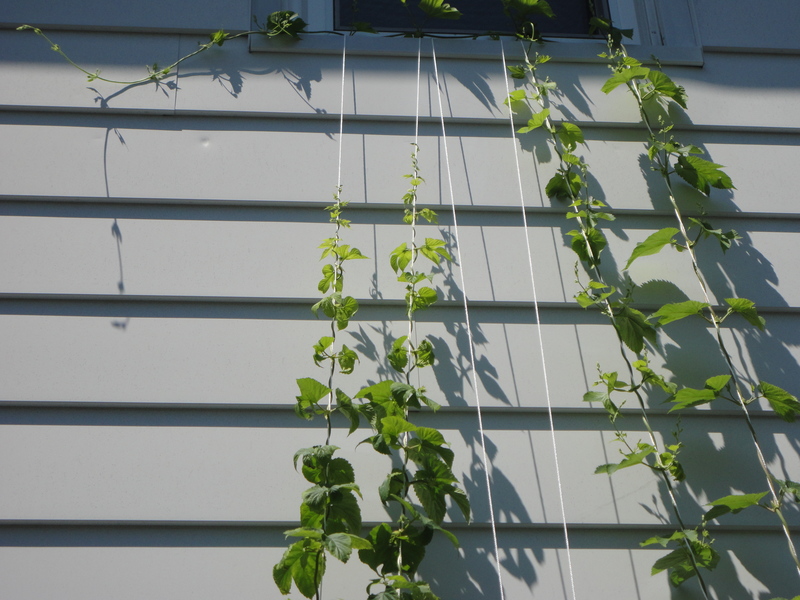 Each plant will have 2 lines, with 3 vines per line (6 total). This will most likely happen next year with established crowns. This year, I expect just one vine per bucket. That is all I have to report for now. I will be doing a write up on the cutting/rooting process in the near future; I just need to take a few more pictures next week when I take more. In the mean time, I have some pictures in a gallery below. I had purchased a seasonal 12 pack from Samuel Adams; the American Classics pack. Now, I had previously tried and reviewed the classic Boston Lager. So I thought it would be neat to do a different sort of post. What if I did a side by side tasting of Boston Lager with the Perfect Pint glass and the Spiegelau tulip glass? The first is a beer glass specifically designed around the SA Boston Lager. The second is a German made crystal tulip glass; my favorite style and specific model. All of my beer reviews are now done in this one. Check out the video for some interesting surprises. On a cold, February Thursday night, Brett, my brew partner and I, drove and hour and change to Plains, PA to visit nanobrewery Breaker Brewing Co. (website). This was my first and Brett’s second trip down to see the two year old, 3.5 barrel commercial garage brewery. 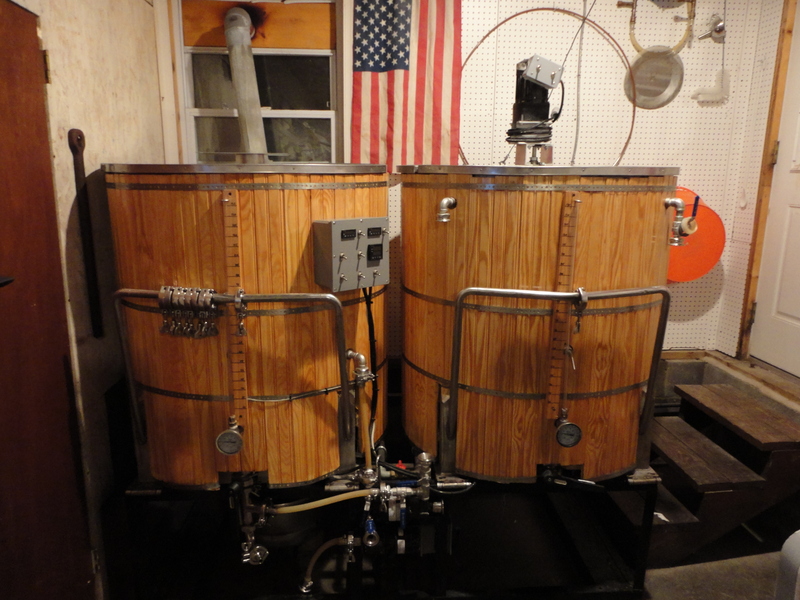 Previously, Brett had purchased three 1/2 barrel kegs that soon became our keggles, which we now use to make 10 gallon batches of our delicious beer. We had gone to the brewery in hopes of having a few questions answered in regards to the opening of our nanobrewery, Black Heart Brewery. Specifically, we are about to order some brand new 1/6 barrel kegs, and wanted to know how they liked theirs. We heard what we hoped we would, and are placing an order very shortly. After we got our first round of questions out of the way and they wrapped up the kegging, we were served a few pints of their craft brew wares. I have a sad confession to make; I did not take one picture of the beers. To remedy this, I promise to return to Breaker Brewing (with beers of our own labor to share), and take those pictures. Up first for me was their Black IPA “Black Diamond”. Coming in at 5% ABV and 65 IBUs, this is a very approachable and drinkable beer. Up front on the nose is big oranges and dark chocolate. Like one of those chocolate oranges, if only they used real oranges. Bold roast up front, with a nice big lingering hop finish, with the simcoe standing out nicely for me. A very solid brew; I hope there is more when I come back. Next was the Lunch Pail Ale with a solid 5.5% ABV and 55 IBUs. It is a very clean, classic northeast pale ale, with a balanced floral nose and a sweet toasty malt finish. One of their best sellers, and I can see why. I was able to sample some of their winter ale that was made with ginger. It had a nice spicy kick to it, and although usually not my style of beer, this one was quite balanced and very drinkable.